Facebook, Forums, Sexting and Snapchat; what in the worldwide web is happening? More importantly, how do we parent well with our children being connected to so much digital distraction and alternative views of the world and life? Join us for a seminar with Chris Parker (Christian Education National) to help you become equipped to navigate your children through the opportunities and threats that a digitally connected life brings. Tea, coffee and supper will be available from Cafe 133. This free seminar is intended for parents of children who have personal access to a device, in particular those in years 7-12. 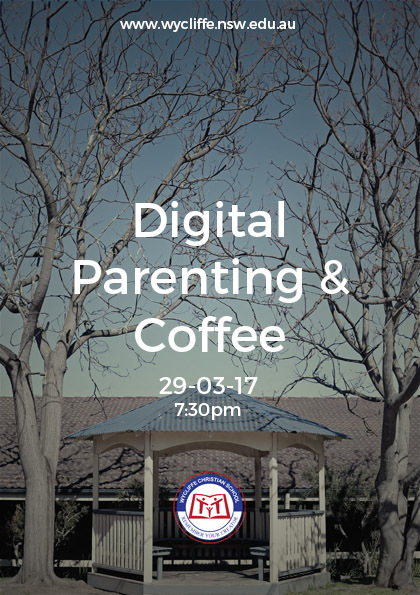 Digital parenting tools for Chromebooks and other BYO devices will also be recommended on the night by ICT staff. Bookings are essential – limited spaces available!